While I’m vacationing in sunny Florida I decided to check out one of the local TJ Maxx stores. After I had dinner with my sister and her husband at a restaurant called Bahama Breeze. Every time I come to Florida that’s a place I have to visit. Their live music bands and casual atmosphere to just sit there and enjoy the music is such a relaxing place to be. But anywho enough about that!! As I walked around in this one particular TJ Maxx I paused and had take a double look at what was in front of my eyes. I couldn’t believe that I came across a not 1, not 2. 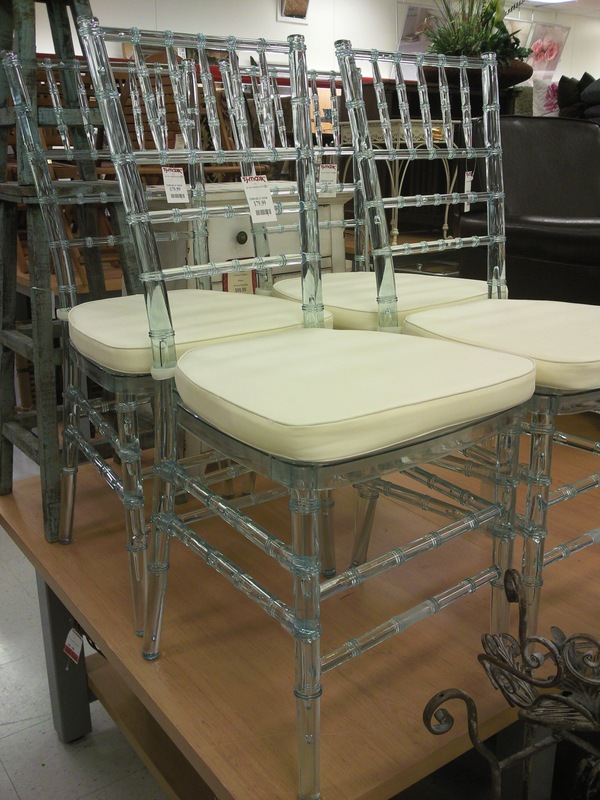 BUT 4 Chiavari Chairs. At best of all their CLEAR!! Of course I already envisioned this being at my dinner table dressed with bright colorful linens just in time for the Easter celebrations. The chairs were only $79.99 each pair. If only I could find these back home in CT…if only!